Vertical platform lifts, commonly known as porch lifts, and wheel chair lifts, are large mechanical platform lifts that ascend a few feet off the ground. They’re typically installed to allow people who require wheelchairs or walkers to bypass a flight of stairs, however they have other accessibility applications as well. A basic vertical platform lift consists of a single, open platform, and a drive mechanism that controls the up-and-down movement of the lift. A more complex platform lift can lift up to 144″. However, they’re typically installed in a garage, near a front door or side door, best suited to get in or out of the house. Often an additional deck or porch is required hence the shorthand names. Porch lifts are best suited for people who are confided to wheelchairs, and want to enjoy life with their family and community members. Don’t let accessibility issues stop you from having a fulfilling life with your loved ones. With porch lifts, you can access difficult areas with your rollator, wheelchair or scooter. Whether you are inside or outside your home, Advantage Home Health Solutions can help determine the right accessibility solution for your unique needs. Never miss an appointment, family function or a day with friends because of accessibility issues. Our lifts are engineered to withstand many weather conditions, from extremely hot, dry temperatures to blistering cold ones. Installed outside, or in a garage, it’ll be available when you’re ready to enjoy the freedom to be outside or with your family once more! Advantage Home Health Solutions’ porch lifts are reliable and economical choices to achieve maximum accessibility in your life. 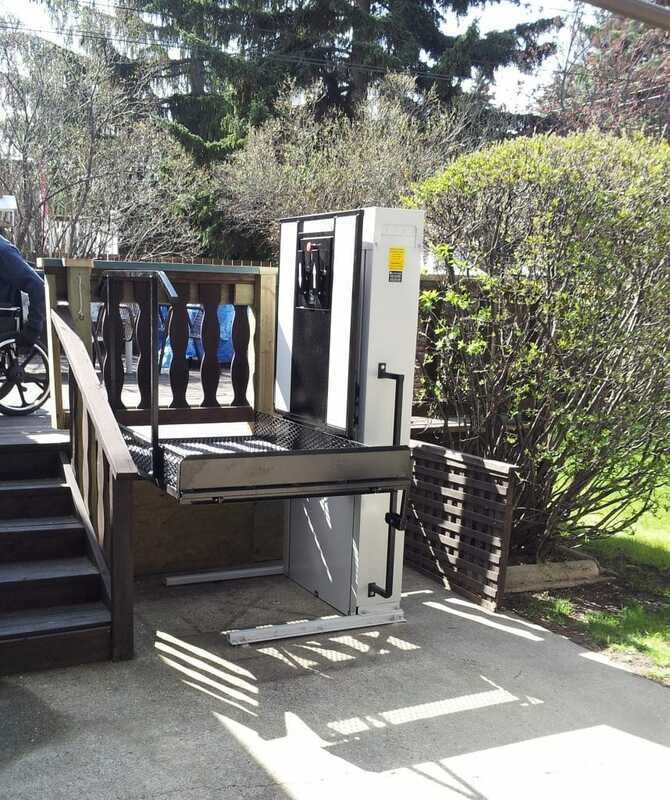 Where a wheelchair ramp isn’t a practical choice, a porch lift can fill the void. To learn more about our porch lifts and if they’re right for you, call us today at (403) 460-5438, or visit our contact us page!